Polymer nanocomposites from multiwalled carbon nano tubes (MWCNTs) and xanthan gum (XG)-poly vinyl alcohol (PVA) polymer blend were prepared at different MWCNTs weight fractions. Rheological results indicated that addition of XG to PVA polymer will enhance rheological properties and thermal stability of MWCNTs-PVA nanocomposite. Addition of MWCNTs up to 1.5 w% will significantly improve storage modulus of the neat polymer blend while the increase of MWCNTs up to 3 w% will slightly decrease storage modulus. Optical results, on the other hand, revealed that MWCNTs are homogenously distributed and well dispersed in the neat polymer. Increasing of nano fillers in neat polymer will decrease optical energy gap from 5.30 eV (for pure XG-PVA) to 3.30 eV. Electrical results implied that adding XG to MWCNTs-PVA nanocomposite system will not highly affect electrical properties of nanocomposites. One of the basics of industrial requirements is to create a new material with attractive physical properties. Hence, extensive researches focused on this field in the last few years [1-3]. In general, the blending of polymers produces a wide range of materials with desired properties. Additionally, engineering of polymer materials with new properties using commercial and available polymers was also considered by many researchers. Such a system has advantages such as simplicity of preparation, a low-cost material with the desired property, easy control in the physical properties, and requires little or no extra expenditure compared to the other polymer synthesis . Xanthan gum (XG) was discovered by Allene Rosalind Jeanes, her research team at the US Department of agriculture, and brought into commercial production under the trade name Kelzan in the early 1960s [4,5]. Xanthan gum derives its name from the strain of bacteria used during the fermentation process, Xanthomonas campestris. This is the same bacterium responsible for causing black rot to form on broccoli, cauliflower, and other leafy vegetables. It is mainly considered to be non-gelling and used for the control of viscosity due to the tenuous associations endowing it with weak-gel shear-thinning properties . Tridib Bhunia et al , investigated the physical properties of poly (vinyl alcohol) (PVA) and xanthan gum (XG) blends irradiated under low dose electron beam, they reported that low molecular weight PVA-XG membranes showed equivalent physical properties under dry condition but wet-mechanical properties were superior for high molecular weight PVA-XG hybrids. Martina Kopčilová et al , investigated on the physical properties of XG-PVA blend and found that with lower polysaccharide content (10-21% w/w) the tensile strength was 15-20 MPa and the elongation at break of all blends was relatively close to the parameter of poly (vinyl alcohol) foil. Additionally, it was reported that xanthan gum enhances the optical activity and conductivity of solutions . Besides, other researchers investigated the physical properties of different polymer-XG systems . However, despite the existence of extensive researches in this field, no any research found to report rheological and optoelectrical properties of MWCNTs-XG-PVA nanocomposites. Generally, adding MWCNTs to polymers will significantly improve the physical properties of neat polymers. However, the choice of CNTs as nano-fillers in neat polymer systems refer to their superior size, shape, and remarkable physical performance of the nanotubes that possess high electrical conductivity, very high tensile strength, and high thermal stability [10-17,14-18], since nanotubes have found applications in various areas such as electrochemical devices, hydrogen storage, field emission devices, sensors, and probes. Furthermore, one of the main challenges faced in the preparation of well-dispersed CNTs-polymer nanocomposites is that nanotubes are held together as bundles and ropes due to the existence of van der Waals attraction between them. As a result, they have a very low solubility in solvents and tend to remain as entangled agglomerates. Hence, many techniques were used to improve CNTs dispersion in a polymer matrix, such as ultra-sonication, plasma, high shear mixing, and surfactant addition and melt blending and chemical modification through functionalization [14-18]. In this work, we focus on rheological and optoelectrical properties of MWCNTs XG-PVA nanocomposite at different weight ratios of MWCNTs. Rheological properties such as storage modulus, loss modulus, and tangent loss will be presented as a function of temperature and MWCNTs content. Besides, glass transition temperature will be determined by dynamic mechanical data. Optical properties such as absorption coefficient and the optical energy gap will be also considered and presented. Additionally, the electrical properties of prepared nano-composite will be presented and discussed. Finally, correlations between dynamic mechanical, optical, and electrical are also reported. Polyvinyl alcohol (PVA, Mw=13,000-23,000) was purchased from Sigma-Aldrich. XG obtained (Aldrich, ign. Residue ≤15%, loss ≤15% loss on drying, viscosity 25-70 mPas, 1 % in H2O (25°C)). Multi-walled carbon nanotubes (MWCNTs) were purchased from Chengdu Organic Chemicals Co. (China). MWCNTs were synthesized by natural gas catalytic decomposition over the Ni-based catalyst and were advertised as having >50 nm diameter, 10-20 μm length, and >95 % purity. Initially, MWCNTs was treated at optimum pH condition  to improve their dispersion in the neat polymer blend. Polymers were dissolved separately in water and ultrasonicated using UP 200S ultrasonicator (Hielsher Company-Ultrasonic Technology) for 1h. Both solutions were mixed at 5 w% XG. The prepared solution was stirred at 30℃ by a magnetic stirrer for 24 h until a homogeneous polymer solution was formed. Functionalized MWCNTs were added to water and ultrasonicated for 30 min. Polymer blend and MWCNTs solutions were stirred again for 24 h until a homogenous nanocomposite is formed at different MWCNTs weight ratios. The obtained solution was cast in a glass petri dish (dia. of 5 cm). The solvent was evaporated at room temperature for 24 h. The film thickness 0.1 mm was measured using electronic digital micrometer (MITUTOYO-China) with 0.001 mm resolution. All rheological parameters were measured in the temperature range 22-145℃ and frequency range 0.1 Hz using dynamic Mechanical Analyzer DMA Q800 (TA Instruments LLC, DE, USA) instrument with film clamps. The tests were performed on film specimens of dimensions 10 mm, length 4mm width, and 0.1mm thick. The measurements were done within strain amplitude of oscillation at 5 mm on film samples. A static pre-load force (0.01N) was applied to the sample prior to the dynamic oscillating force to prevent film buckling. During all measurements, the instrument was programmed to maintain the static load at 125% of the force required to oscillate the sample. It is important that the film remains in its linear viscoelastic region during measurement, so the experiments were recorded with constant strain. Generally, for thin polymer films, linear viscoelastic behavior can be assured with a strain of less than 0.1%, and so this limit was used. Optical measurements were carried out using Shimadzu UV-visible spectrophotometer model UV-3600 (Japan). Measurements were performed in the wavelength range of 200-800 nm with a scan step of 0.5 nm. The optical absorbance (A) spectra were collected at room temperature. The absorption coefficient alpha was calculated from the absorbance (A). After correction for reflection, it was calculated using a formula which has been reported previously . Electrical measurements (in both DC and AC fields) were performed using the 4200-SCS Semiconductor Characterization System (KEITHLEY Co.) at 70℃, and frequency range 1kHz-10 MHz. Samples were shaped into circular discs having an area (A) of 1.2 cm2 and thickness (d) of 0.1 mm and placed between two copper electrodes. Dielectric parameters in the AC field such as conductivity and dielectric constant (k) were calculated from the electrical impedance (Z) and phase angle (ϴ) . 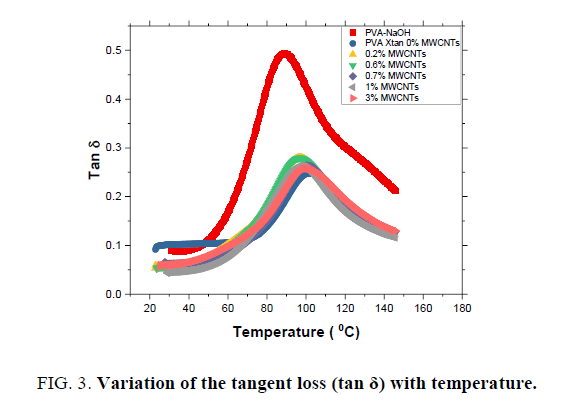 Storage modulus G’, loss modulus G" and tangent loss for MWCNTs-XG-PVA nano-composites are presented in FIG. 1-3 as a function of temperature and MWCNTs weight fraction at 0.1 Hz. The values of the glass transition temperature (Tg) are listed in TABLE 1. It is obvious that the addition of XG to PVA polymer enhances the rheological properties and thermal stability of MWCNTs-PVA nanocomposite which means that the addition of XG to prepared nanocomposite system will enhance the interfacial bonding in the MWCNTs-PVA network. Besides, the addition of MWCNTs up to 1.5 w% will significantly improve storage modulus of the neat polymer blend while at a higher level of MWCNTs content (3.0 w%) the storage modulus slightly decreases (see FIG. 1). Such a decrease can be attributed to the increase of the distance between polymer chains at this level of MWCNTs content which means that the physical bond between polymer chains will decrease. However, mechanical results indicate that MWCNTs are well dispersed in the neat polymer blend system with enhanced CNTs-polymer blend interfacial bonds [13,14]. Figure 1: Dependence of storage modulus (G?) 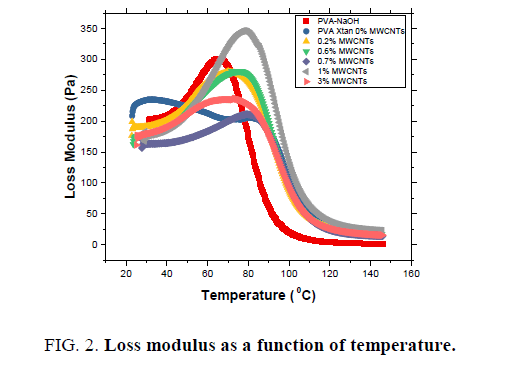 on temperature for MWCNTs-XG-PVA nanocomposites. Figure 2: Loss modulus as a function of temperature. Figure 3: Variation of the tangent loss (tan ?) with temperature. Table 1: Values of glass transition temperature (Tg) for prepared samples. Absorption coefficient (α) was calculated for prepared nano-composites from the absorbance data (A)  and the obtained results are plotted in FIG. 4. It is clear that the polymer blend has a strong absorption band at UV region below 300 nm and the addition of MWCNTs will enhance the UV absorption of the neat polymer blend. Such enhancement, however, only reflects the superposition of the individual absorption for each XG, PVA and MWCNTs components. In general, optical results indicate that MWCNTs-XG-PVA system is a homogeneous system with well-dispersed MWCNTs. The optical energy gap (Eg) values for MWCNTs-XG-PVA nano-composites were determined using Mott, Davis, and Tauc formula  obtained data for all samples were plotted as (αhν) 1/r versus photon energy (hν) to determine optical energy gap from the resulting plot (FIG. 5). The best straight line obtained for all polymer blends was with r=3/2, and this indicates that the electron transition is a forbidden direct transition in the k space. The values of Eg were obtained from extrapolating the straight-line portion in the higher energy range of FIG. 5 to an (αhν) 2/3=0. The obtained values are presented in FIG. 6. Obtained results show that Eg decreases from 5.30 eV for pure XG-PVA to 3.30 eV with increasing of MWCNTs up to 3.0 w%. The obtained result could be attributed to the formation of localized states in the forbidden gap . Additionally, FIG. 6 indicates that the optical energy gap and MWCNTs weight fractions have nearly exponential correlation and MWCNTs- XG-PVA system is optically percolated at around 0.25% MWCNTs. 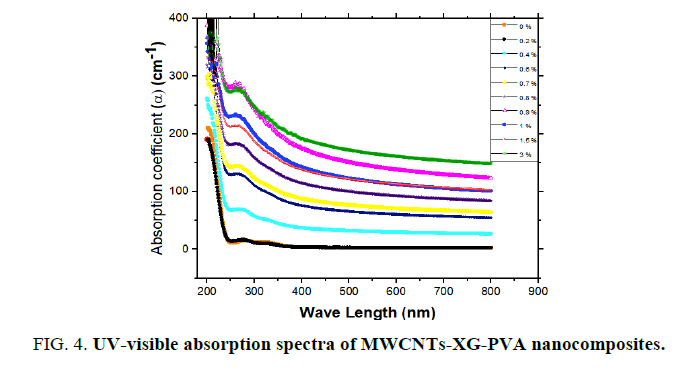 Figure 4: UV-visible absorption spectra of MWCNTs-XG-PVA nanocomposites. Figure 5: (αhv) 2/3 versus photon energy (hv) for A (0.0 w%), B ( 2.0 w%), C (3.0 w%) for nanocomposites respectively. 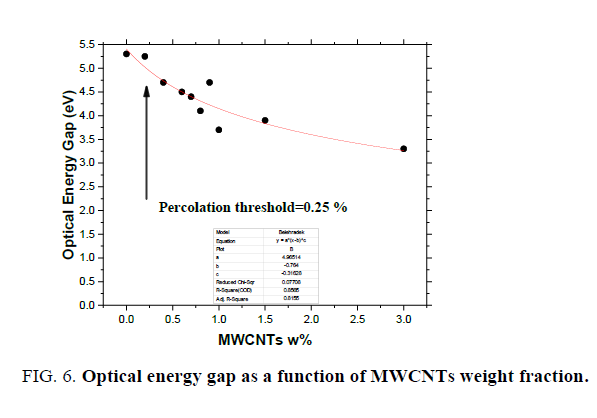 Figure 6: Optical energy gap as a function of MWCNTs weight fraction. Current (I)-voltage (V) characteristics of the MWCNTs-XG-PVA nanocomposites with different MWCNT weight ratio at 70℃ are shown in FIG. 7. These characteristics indicate that the current level in these composites increases with the addition of MWNTs. This is consistent with the fact that the conductivity of the composites increases as the MWNTs concentration increases and such a trend was also observed previously by us in MWCNTs-PVA nanocomposites . The charge transport mechanism based on the general power law model I=KVm, where K is a constant and m is the exponent, has been widely used for the analysis of the conduction phenomenon inorganic or polymeric materials [11,15,20]. The model is divided into three regions, Ohmic (m=1), trap-free space charge limited (m=2), and trap charge limited (m>2) . I-V characteristics on log-log scales (FIG. 8) reveal one distinct region which can be fitted using the general power law model. The obtained results reveal that the exponent m is determined to be around 1, implying that the current varies linearly with voltage and hence the charge transport mechanism is governed by Ohm’s law. FIG. 9 shows the variation of total impedance Z with frequency at 700ºC for MWCNTs-XG-PVA nanocomposites. Dielectric constant and AC conductivity for prepared nanocomposites were also determined from obtained Z and phase angle data  for MWCNTs-XG-PVA nanocomposites and obtained results are listed in TABLE 2. Generally, electrical results indicate that the addition of MWCNTs to XG-PVA neat polymer blend will insignificantly effect on the electrical properties of the neat polymer blend. 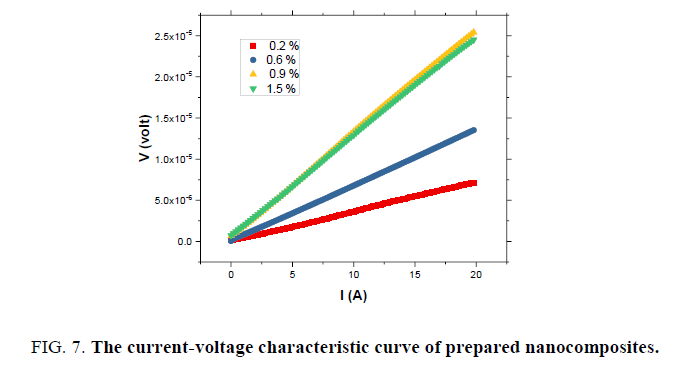 Figure 7: The current-voltage characteristic curve of prepared nanocomposites. 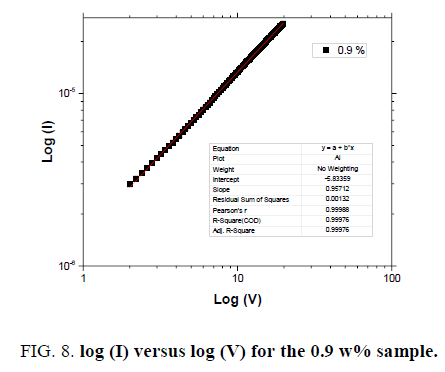 Figure 8: log (I) versus log (V) for the 0.9 w% sample. 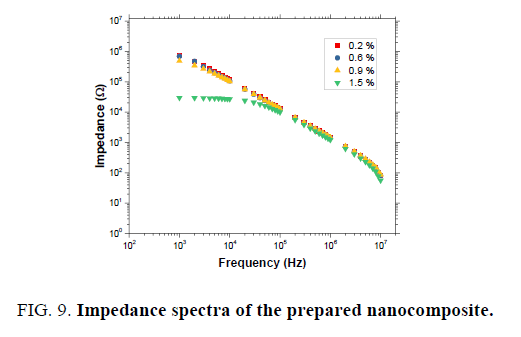 Figure 9: Impedance spectra of the prepared nanocomposite. Table 1: Band gap values of the particles formed with various concentration of the cadmium and the particle sizes. The author would like to thank Prof. Ayman Ayesh and Prof. Rami A Abdel-Rahem for their support and help. This investigation demonstrates new and important additions to the physical properties of MWCNTs-XG-PVA nanocomposite systems. Rheological results reveal that mixing of XG with PVA polymer will enhance the rheological properties and thermal stability of MWCNTs -PVA nanocomposite. At the same time, the addition of MWCNTs up to 1.5 w % will significantly improve storage modulus of the neat polymer blend while a slight decrease found at the higher level of MWCNTs content (3.0 w%). Optical results show that MWCNTs are well dispersed in the neat polymer blend system. Incorporation of MWCNTs to XG-PVA polymer blend will enhance the UV absorption of the neat polymer blend and an optical energy gap Eg decreases from 5.30 eV (for pure XG-PVA) to 3.30 eV with the increase of MWCNTs. Finally, electrical results show that the addition XG to nanocomposite system will not highly affect the electrical properties of prepared nano-composites. Ibrahim SS, Ayesh AS. Preparation and characterization of poly (3-octyl thiophene)/polyvinyl chloride polymer blends. J Plast Film Sheeting. 2013;29(3):211-27. Abdeen MA, Ayesh AS, Ibrahim SS, et al. Preparation and physical characterization of conjugated polymer-polycarbonate polymer blends. J Compos Mater. 2014;48(16):1947-57. Pawde SM, Deshmukh K. Characterization of polyvinyl alcohol/gelatin blend hydrogel films for biomedical applications. J Appl Polym Sci. 2008;109(5):3431-7. Bhunia T, Giri A, Nasim T, et al. Uniquely different PVA-xanthan gum irradiated membranes as a transdermal diltiazem delivery device. Carbohydr Polym. 2013.;95(1):252-61. Barrere GC, Barber CE, Daniels MJ. Molecular cloning of genes involved in the production of the extracellular polysaccharide xanthan by Xanthomonas campestris pv. campestris. Int J Biol Macromol. 1986;8(6):372-4. Bhunia T, Giri A, Nasim T, et al. Uniquely different PVA-xanthan gum irradiated membranes as transdermal diltiazem delivery device. Carbohydr Polym. 2013;95(1):252-61. Kop?ilová M, Hubá?ková J, R? ?i?ka J, et al. Biodegradability and mechanical properties of poly (vinyl alcohol)-based blend plastics prepared through extrusion method. J Polym Environ. 2013;21(1):88-94. Milas M, Rinaudo M. Properties of xanthan gum in aqueous solutions: role of the conformational transition. Carbohydr Res. 1986;158:191-204. R Badwaik H, Kumar Giri T, T Nakhate K, et al. Xanthan gum and its derivatives as a potential bio-polymeric carrier for drug delivery system. Curr Drug Deliv. 2013;10(5):587-600. Farrag EA, Abdel-Rahem RA, Ibrahim SS, et al. Electrical and optical properties of well-dispersed MWCNTs/PVA nanocomposites under different pH conditions. J Thermoplast Compos Mater. 2018:0892705718759705. Ibrahim SS, Ayesh AS. Electrical and optical properties of functionalized multiwalled carbon nanotubes/poly (3-octylthiophene)/polystyrene composites. J Thermoplast Compos Mater. 2015;28(2):225-40. Mallakpour S, Rashidimoghadam S. Application of ultrasonic irradiation as a benign method for production of glycerol plasticized-starch/ascorbic acid functionalized MWCNTs nanocomposites: investigation of methylene blue adsorption and electrical properties. Ultrason Sonochem. 2018;40:419-32. Mallakpour S. Ultrasonic-assisted fabrication of starch/MWCNT-glucose nanocomposites for drug delivery. Ultrason Sonochem. 2018;40:402-9. Koizhaiganova RB, Kim HJ, Vasudevan T, et al. Double-walled carbon nanotube (DWCNT)-poly (3-octylthiophene) (P3OT) composites: Electrical, optical and structural investigations. Synth Met. 2009;159(23-24):2437-42. Abu?Abdeen M. Investigation of the rheological, dynamic mechanical, and tensile properties of single?walled carbon nanotubes reinforced poly (vinyl chloride). J Appl Polym Sci. 2012;124(4):3192-9. Ayesh AS, Ibrahim SS, Abu-Abdeen M. Low percolation threshold of functionalized single-walled carbon nanotubes-polycarbonate nanocomposites. J Reinf Plast Compos. 2012;31(16):1113-23. Kim DJ, Jo MJ, Nam SY. A review of polymer-nanocomposite electrolyte membranes for fuel cell application. Ind Eng Chem Res. 2015;21:36-52. Abdel-Rahem R, Ayesh A, Ibrahim S, et al. Novel dispersion of MWCNTs in polystyrene polymer induced by the addition of 3- Hydroxy-2-napthoic acid. J Disper Sci Technol. 2014;36:353-62.